I know cars, but beyond the Griffith sports car name, this Series 200 race car was new to me. That’s how rare they are in the car world (only 192 were made), and in the die-cast car world. But rare is good when you’re collecting. 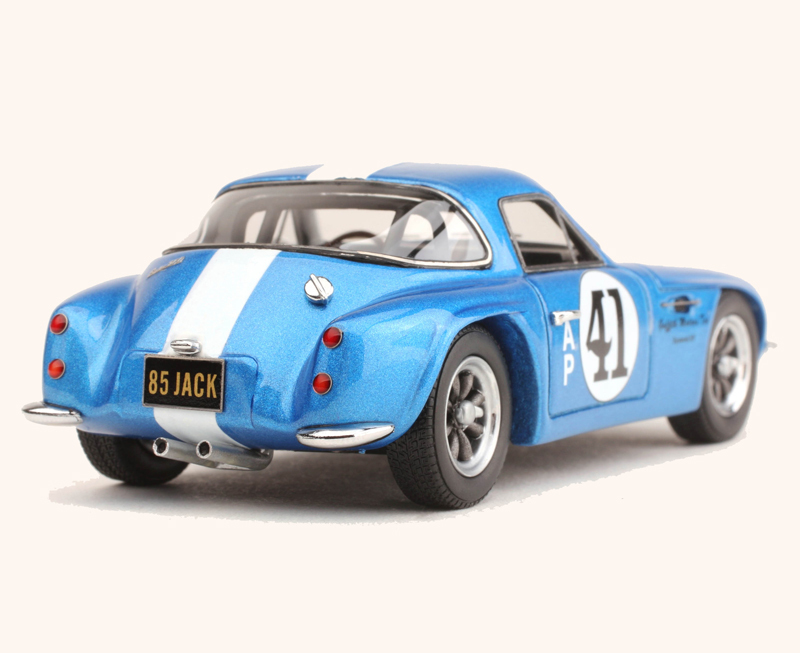 The review car is a stunning 1:43 metallic blue Griffith Series 200 from Automodello, a newer specialty die-cast car maker from Buffalo Grove, Ill. To make this one even more special, it’s one of just 85 Tribute Editions that were made to mark Jack Griffith’s 85th birthday. He founded the car company. The car’s license even reads “85 Jack.” Plus this model is autographed by Griffith and Bill Warner, who puts on the Amelia Island Concours d’Elegance each year and which recently honored Griffith. That means this model retails at $235, but don’t worry, Automodello also offers models at a more approachable $95 price tag. Griffith cars were special built lightweight fiberglass-bodied sports cars, first created in the mid-1960s. Jack Griffith wanted to out-do Carroll Shelby by dropping a Cobra V8 into a TVR Grantua. Ultimately Griffith ordered TVR chassis from England and modified them to house larger U.S.-built V8s. These became little monsters on the road racing scene and reportedly had a top speed of 150 mph. Mark Donahue, later an Indianapolis 500 winner, raced one early in his career. 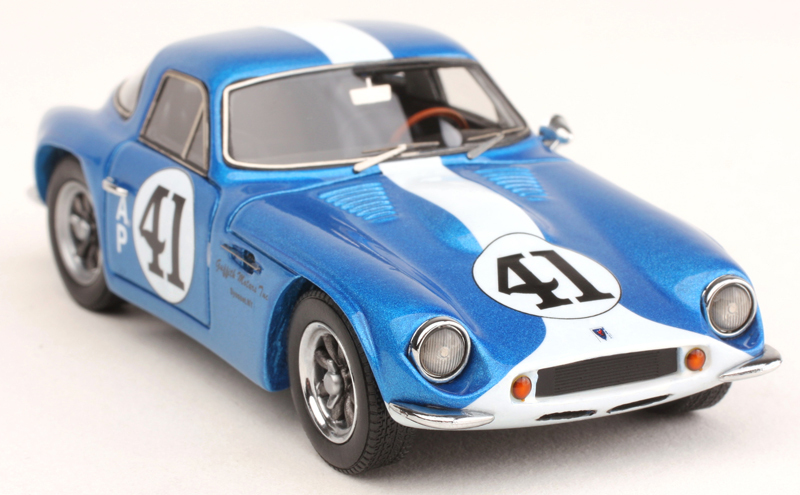 Performance: This Griffith is a little gem in this scale and decked out in such a brilliant metallic blue paint scheme. The white race stripe and numbers are excellently executed along with the logo on the nose and A-Production decal on the doors. Those with good eyesight can even read the script Griffith Motors Inc. logo just in front of the door. The chrome headlight surrounds, driver’s mirror and door handles are well done, plus the model has a chrome gas cap, trim around the windows and delicate little windshield wipers. Head and taillights look good too and there are dual chrome center exhausts. Automodello also creates attractive wheels with their knock off hubs that scream that this is a real racer. Unlike many 1:43 scale models, the interior also is well executed, with a wood-look racy 3-spoke steering wheel along with accurate dash gauges, plus chrome door and window handles inside. I don’t recall ever seeing that before on a 1:43 scale model. This being a racer, there’s also a roll bar. Finale: This edition will be hard to come by, but any of the other Automodello Griffiths are worth adding to you collection, especially if you love rare racers. 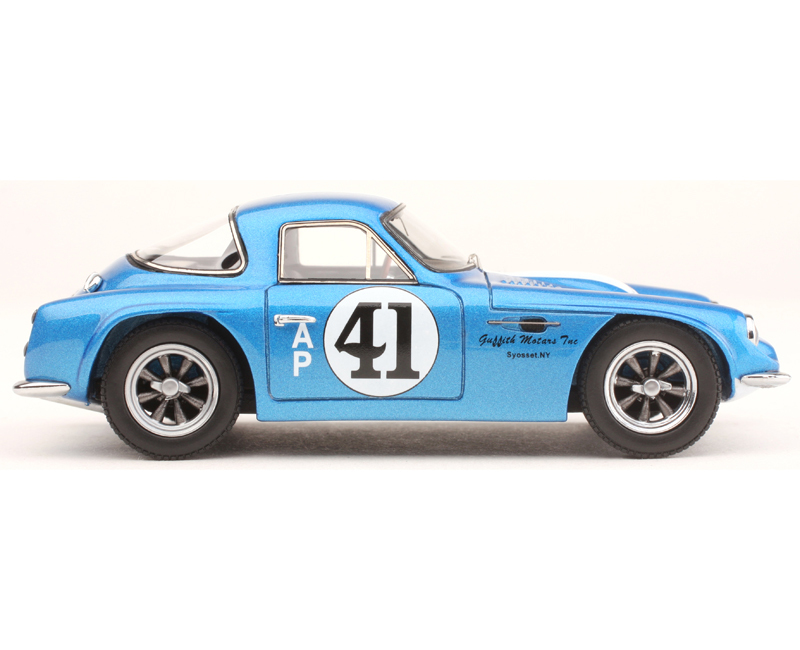 Automodello offers the same model as this review car, but without the autographs, at $95, plus it offers a couple other street version Series 200 Griffiths in red and silver-blue that retail for $95. Automodello also has a new 1974-76 Bricklin SV1 with gull-wing doors and a 1972-79 TVR M-Series roadster at $95. Watch for some extremely rare vintage models too, including a 1956-58 Dual Ghia in coupe and convertible, and a 1934 Duesenberg J. The Griffith series is definitely going to be a collectible. The price for this die cast car is a bit high but worth the investment to have it in my collection. It would be nice to have it with the autographs. Thanks for the comments Greg. Yes, this is a beauty and nice to see some rarer models created for collectors. We all love the Mustangs and Corvettes, BUT there is a lot of other cool stuff we’d like to see too.